Debbie is a 45 y/o woman who I have been working with for about four years. She was diagnosed with a severe bipolar disorder at age twelve. About 10 years ago, she had a lifting injury at work and developed chronic low back pain. Over a series of eight years, she underwent multiple low back surgeries. It began with a laminectomy at L5-S1. About a year later, a fusion was performed at L5-S1, but it did not heal. She then required another surgery to repair the fusion. Her back pain did not improve; in fact, it worsened. Her fusion was extended up to L4-5, which still did not improve her symptoms. In an effort to improve this poor outcome, the screws and rods that had been place to create the fusion were removed, and bone spurs were trimmed away from her nerve roots. Up to this point, she was not my patient. I had assisted on her last operation that was done on a Wednesday morning. I was the on call surgeon for my orthopedic group the next weekend. I made rounds on her about noon on that next Saturday. She was in a lot of pain and was not moving her legs. I thought it was probably just from the pain and turned around and walked out of the room. About five minutes later, I turned around and re-examined her. I still could not tell what was going on, so I ordered an emergency MRI. By some unfortunate chance, she had a massive disc rupture at L3-4 just above where we had done the prior surgery at L4 to S1. We took her to surgery immediately and excised the disc. She ended up a paraplegic. Over the next 18 months, she developed repeated bladder infections requiring several urological interventions. She also had yet another major spine operation to extend her fusion up to L3-4, which, unsurprisingly, did nothing to abate her pain. Life became progressively worse. She had to fight with the state for basic medical coverage. She had little family support. There was a neighbor who was extremely difficult to get along with. I don’t think there a word in my vocabulary to describe the depths of her anger and despair. I would see her on a monthly basis just to maintain some sense of structure and deal with her need for pain medications. She was open to the DOCC protocol and read the book draft that I have been emailing to my patients. 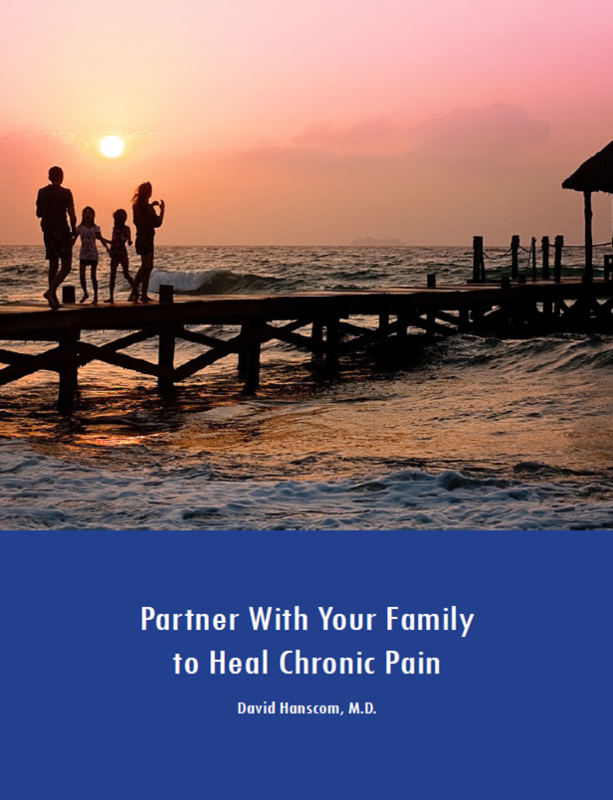 The book lays out a detailed plan addressing most of the variables that affect the perception of pain. The one tool she engaged in with a vengeance was writing down her negative thoughts and throwing them away. In the midst of all of her bladder and medical issues, I would see her back on a monthly basis just to refill a stable dose of pain and sleep meds. As I was able to improve her sleep she felt somewhat better. 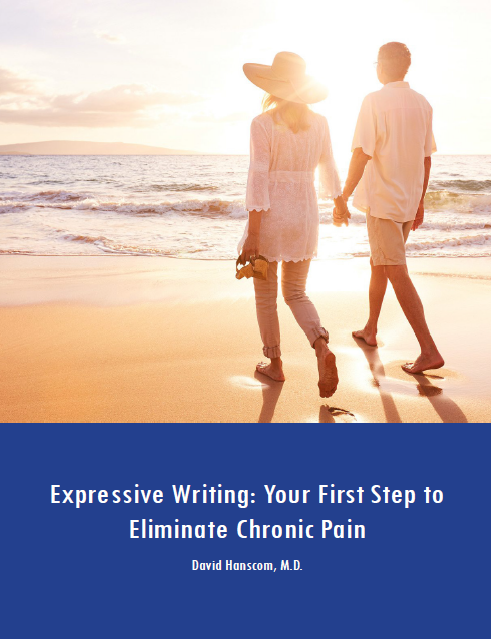 With the writing, her pain also began to diminish. My role was to guide her in different directions with the writing and other reading resources. I tried for a year to get her to a pain psychologist, but the state would not cover psych services. I was feeling pretty good about the progress she was making. Her pain was at a manageable level, her medical issues stabilized, and she began to get definitive treatment for her bladder issues. I was prepared to simply maintain her program. Then it fell apart. She got sick from her bladder infections. The fighting within her apartment complex became more intense. Her pain level shot through the roof. She was so angry, I did not know what to do. So we had it out. My point was that her life was not bad–it was terrible. She had every right to be extremely angry. I would describe her mood as rage. I confronted her with the idea that the energy she was burning being angry was the energy she needed to solve her problems. Our conversations were blunt and she became even angrier with me as I was “not supportive.” I acknowledged her right to be angry, but it was still destroying her. The more legitimate your anger, the harder it is to let it go, and the more destructive it is to your sense of well being. Additionally, it was really firing up her pain pathways. She was also upset with me because I would not increase her pain medications. Whenever your peace of mind is dependent on external circumstances, you are at the mercy of those circumstances. For three months, we went at it. Every conversation began with her ranting about all the things that were wrong with her life. Meanwhile, I ran across a book, “Forgive for Good” by Fred Luskin. His book is based on his experience doing several major research projects at Stanford University on the physiological effects of anger and forgiveness. One of his projects involved studying parents who had experienced the nightmare of having a child murdered. As much work as I had done on looking at my own expert role of playing a victim, this book really shook me up. He is very blunt on the effects of anger. You either have to truly forgive the person who wronged you, or pay the price. Last summer, I gave Debbie this book. She had continued to do her writing exercises and work with the “Feeling Good” book. About four months ago, she came in smiling. Her demeanor was dramatically different. She was pleasant and engaging. There was also a marked decrease in her pain. I don’t know exactly what happened, as I am not a counselor and my role is more of a coach. I had just held out the idea that although she really was a true victim there was nothing that was going to change. She was permanently paralyzed. She had long-term chronic pain and she had no real ability to improve her financial situation. I had been discussing the role of anger in flaring up her pain, but her anger was so deep that she could not hear me. To her credit, she could still hear me enough to read “Forgive For Good” and she got it. The same commitment with which she had engaged in the DOCC Project was channeled into learning Luskin’s concepts, and Debbie did the exercises he recommended. Forgiveness is not an intellectual exercise. It also takes awareness and admission that anger is a problem. It is difficult to let go of “being right.” Somehow, Debbie did it. What was really stunning is that her bipolar symptoms essentially disappeared. Her anxiety diminished and she came off all of her bipolar meds. She re-established a relationship with her family and several friends. Her family is planning on helping her purchase a computer. It is important to her to begin to reach out and help others who are in a wheelchair and in pain. She is beginning to create a life for herself. Initially, I did not believe her, and every month for the last six months I kept asking her the same questions about her quality of life. And yet, she is very clear that she is happier in wheelchair than she was when she was bipolar and able to walk. Her pain continues to steadily diminish. Her case is one of the most surprising and rewarding situations I have witnessed in my practice. I will give myself some credit for sticking with her, although I was really ready to discharge her from my care several times. It was her being open to new ideas and committing herself to seeking real change that made the difference. I offer the same tools to all of my patients, but only a small percentage will engage with the concepts. Sustained anger will destroy every part of your life. It also intersects with pain pathways. Make a simple choice. Let it go!